This list draws on a few different criteria to determine the highest "score," but the most important element is that it's a dynamically updating list -- which means the ranking will change automatically over time. Right now, the plan is to update every Sunday night. 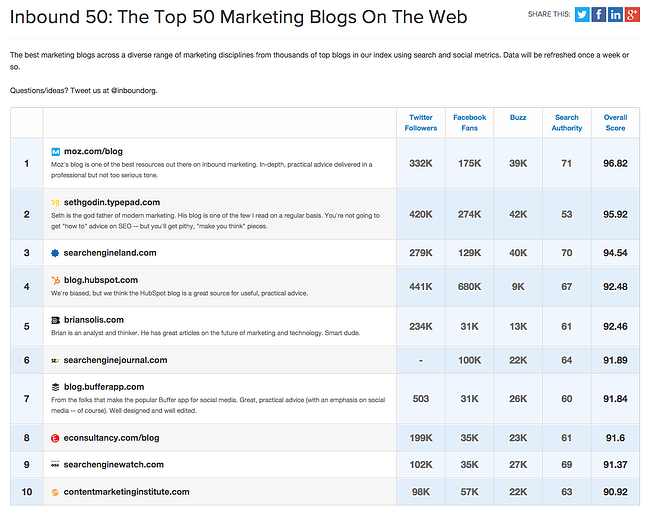 Because the list is based off an algorithm that updates the rankings in real time, the list in the image above may look different than the list that appears on inbound.org. Click to see the full list of all 50 blogs. A few things -- one big one was a desire to help SEO-focused marketers with other tasks, challenges, and data. We also felt that SEO was expanding so much in scope that it seeped into arenas like social media, content marketing, public relations, and even email. As the engines advance and as the web's influencers expand how they discover and share content, SEOs have had to follow suit. Thus, they needed tools, data, and educational content to help with these new job requirements. SEO isn't just SEO anymore! 3) You have an incredibly engaged reader community -- what role did they play in the growth of your blog? I did a piece many years ago about how to create the "perfectly optimized page," and I've updated that resource many times since (including an all-nighter I pulled last year to entirely revamp it and create new graphics from the ground up). My last edit was small, but since I made it recently, that post is particularly fresh in my mind. Don't expect much in your first few years of blogging -- if you do, you'll be sorely disappointed (often to the point where you give up). Great blogs are built over many years (with very few exceptions). Pay attention to what works, what doesn't, and most importantly -- why. That's the way all the great bloggers I know have built their successes.